Canon Patrick Thomas, Chancellor of St. David’s Cathedral and Vicar of Christ Church in Caerfyrddin, gave this book to me while we waited for the bride to arrive for a Christmastide wedding. I’ve always been interested in Armenia since so many of my school friends were from this country. What makes this book even more valuable to me is that Canon Patrick has discovered historical connections and similarities between Cymru (Wales) and Armenia that illuminate the strengths and sufferings of both small countries. The Senedd (the Welsh government) is one of only a few countries which has recognized and commemorated the atrocities inflicted on the Armenians by the Turks. 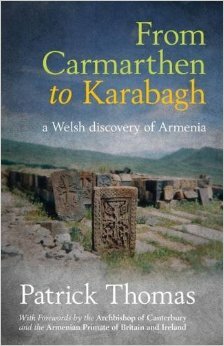 From Carmarthen to Karabagh: a Welsh discovery of Armenia is available on Amazon.